Kuala Lumpur, 13 June 2016 – Epson today announced the launch of its award-winning high performance SureColor P-Series SC-P10070 and SC-P20070, utilising the most advanced imaging technologies for the display graphics and fine art photography markets. The SureColor P-series leverages an impressive 8,000 nozzle PrecisionCore MicroTFP print head, innovative media feeding system, and reformulated Epson UltraChrome PRO nine-color pigment ink system to provide unparalleled production speeds and unmatched print quality. Awarded ‘Best Photographic Printer’ at the recent European Digital Press Association (EDP) Awards at Drupa 2016, the revolutionary SC-P20070 printer is up to 2.8 times faster than the previous model. The 64-inch SureColor P20070 and 44-inch SureColor P10070 comes with an all-new Epson 10-channel PrecisionCore microTFP print head. Utilizing ten individual PrecisionCore ‘Blades’ for outstanding print speeds and extreme dot placement accuracy, the P-series printers provide true production-level printing without sacrificing print quality. Epson UltraChrome PRO is the first pigment ink set to feature four-levels of gray ink technology, to provide seamless transitions with less visible noise and reduced bronzing for superior grayscale output. The ink provides more efficient ink use for a lower total cost of operations. Black pigments are 1.5 times denser than previous generation inks. In addition, the SureColor P20070 and P10070 utilizes improved Resin Encapsulation Technology for output with superior gloss uniformity, and exceptional overall contrast ratio and clarity. “The SureColor P-series redefines fine art and photographic printing with its new advanced capabilities in printhead and all-new inks that provide unsurpassed image quality at super-fast production speeds. The new printers are a breakthrough in delivering a new level of quality and performance, while keeping operations costs low to meet the business and needs of the industry,” said Danny Lee, General Manager-Sales & Marketing, Epson Malaysia. The annual EDP Awards recognise the very best new innovative products and developments launched in the digital printing market in Europe. The 10th EDP Awards was announced at Drupa in Düsseldorf in June 2016. Epson PrecisionCore MicroTFP Print Head Technology: Ten-channel print head offers high-performance and consistency to deliver high-production, high-quality output. Providing high resolution printing of 2,400 x 1,200 dpi, printhead supports variable size ink droplet technology as small as 3.5 picoliters for remarkable print quality. New enhancements include Nozzle Verification Technology and automatic nozzle cleaning without the use of additional media. Epson UltraChrome PRO Inks: UltraChrome PRO inks utilize the first four-level gray ink including Gray, Light Gray, Dark Gray, and Black pigments technology to produce outstanding grayscale prints. New yellow pigment formulation for up to twice the overall print permanence and longevity when compared with previous generation ink set. Individual ink cartridges up to 700 ml enable users to avoid production downtimes and maximize profitability. 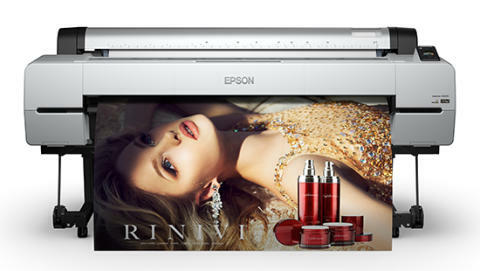 The SureColor P20070 and P10070 are designed exclusively for use with Epson ink cartridges. New Advanced Media Feeding System: Featuring all-new CMOS sensors, the SureColor P20070 and P10070 captures photographs from the back side of the media in real-time and incorporates a pattern recognition algorithm to ensure accurate and precise media placement. In addition, new inductive rollers automatically load cut sheet media without a skew and protect media from scratches throughout the printing process. Advanced Cut Sheet Media Handling: Ideal for softer fine art papers, such as the Epson Legacy Paper line, the SureColor P20070 and P10070 supports accurate cut sheet media loading for 13” x 19” up to 64” wide. In addition, the SureColor P20070 and P10070 supports straight-through poster board media up to 1.5mm thick from 17” to 64” wide. Border Free printing is also supported for a variety of media sizes. Optional Internal Print Server: A secure, internal 320GB print server boosts workgroup productivity by quickly transferring print jobs to free-up workstations; adds print queue management, as well as print job save and reprint functionality. Optional True Adobe Postscript 3 Hardware Engine: Optional Postscript engine enables direct and hot-folder batch printing and support for secure PDF printing; and is fully compatible with the latest Adobe Creative Cloud software suites. Optional Auto Take-up Reel System: User-installable and intended for unsupervised production of large print runs with roll-to-roll requirements.